Highland Green Golf Club features a challenging nine-hole course nestled in a 650-acre expanse of Midcoast Maine. The Scottish-style course is located just off the Coastal Connector in Topsham, Maine and is part of the Highland Green Adult Resort Community. A lodge-style clubhouse, putting green and golf shop are part of the facilities. The course was built to blend naturally with the beautifully rugged terrain of Midcoast Maine. Rock outcroppings and natural ridgelines have been incorporated into the design to add to the challenge and uniqueness of the course. Contact Highland Green Golf Club at 207-725-8066 for more information and details on holding a golf outing at the course. Contact Highland Green Golf Club at 207-725-8066. Contact Highland Green Golf Club at 207-725-8066 for onsite or nearby dining options. 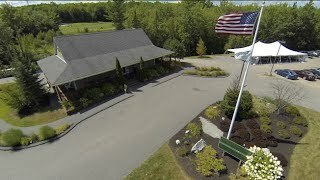 Watch the Highland Green Golf Course, Topsham, Maine Video. This profile was last updated on 03/01/2018 and has been viewed 9,812 times.